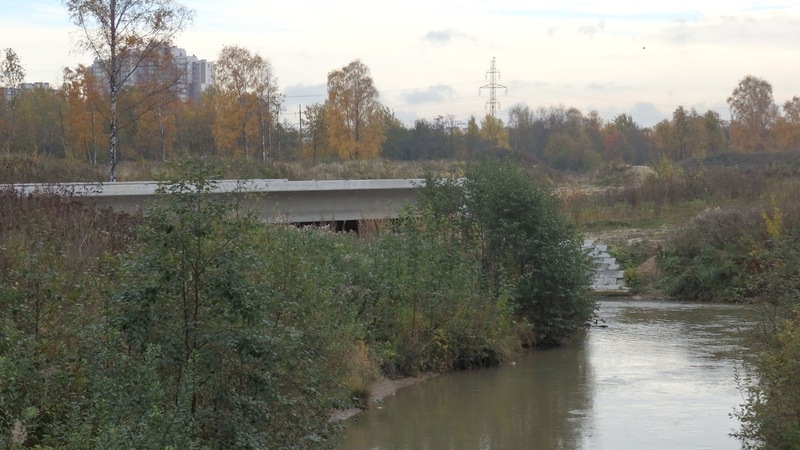 When, the other day, some friends and I strolled from the Dybenko Street subway station to the now-thriving former village of Kudrovo, just across the city lines in neighboring Lenoblast (Leningrad Region), we took a short cut through this semi-wild scrub land, transversed by the Okkervil River. 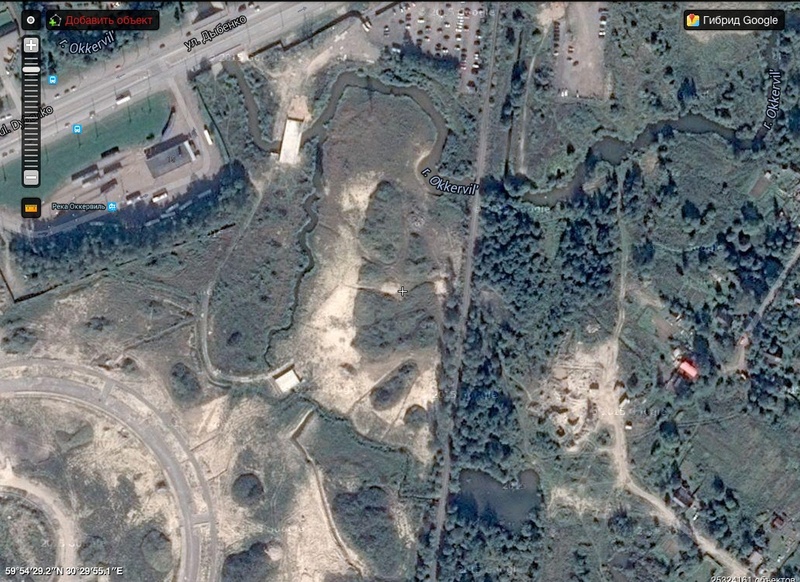 The maps identify this place, just as euphemistically, as Ingria Technopark. One of our companions was a local. He recalled when Ingria Technopark was a forest, and he went there with his school class to do orienteering, map and compass in hand. He claimed, perhaps facetiously, that the village of Kudrovo was all that remained of the ancient Kudrian civilization. The Kudrians had been defeated by the more aggressive Petersburgians from the west, but had not entirely succumbed to their dominion. The strange semi-circular pattern you see in the lower left corner of the map, above, was imprinted there by a giant Kudrian megalith, he ventured. 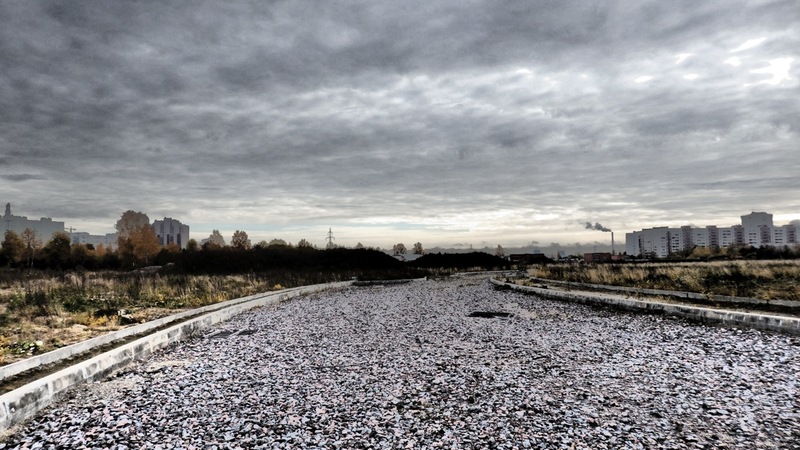 Bits and shards of this now-vanished sacred complex were scattered all over the barren urban wilderness we were crossing. It seemed as if the developers now lazily developing (or no longer developing, probably) Ingria Technopark had tried to lay out a road on the template left by the megalith. Finally, after an hour or so of ditch jumping and bushwhacking, and with the help of some timely advice given to us by a young couple with a feisty pit bull grilling shashliki in the woods, we emerged from the outer darkness into the village of Kudrovo. In the last few years, the once-sleepy village has been transformed into a series of eye-poppingly bright new housing estates. The remnants of the old village of Kudrovo are visible against the new estates rising to the east and south. 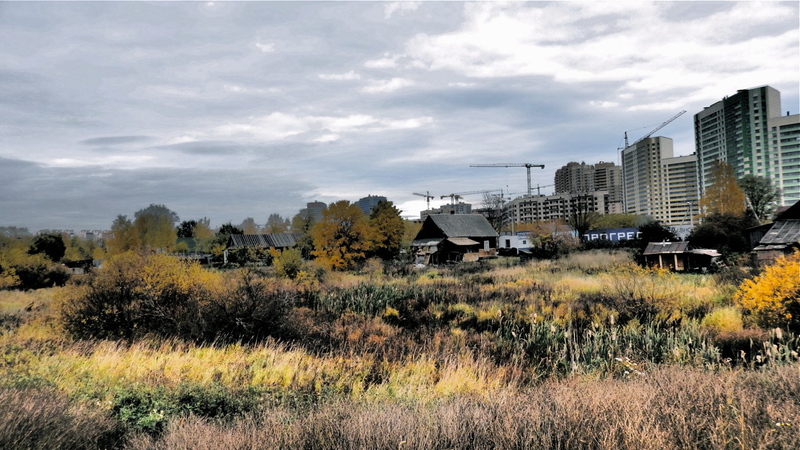 According to the Real Estate Bulletin, New Kudrovo was originally conceived as a new administrative center for Lenoblast. 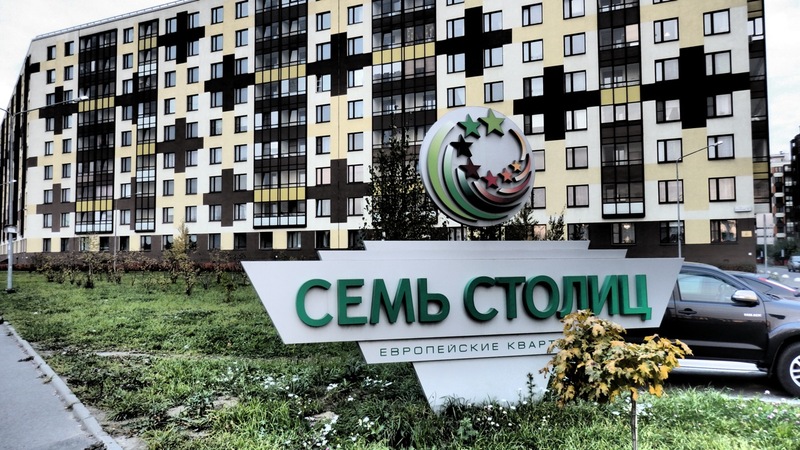 Somewhere along the way, that scheme was scrapped, and in 2009, developers Setl City announced they would transform Kudrovo into a series of “European”-inspired housing blocks collectively dubbed Seven Capitals. In the event, Setl City managed to build the first of the Seven Capitals, Vienna, and is scheduled to complete the second block in the project, London, in the third quarter of 2017. 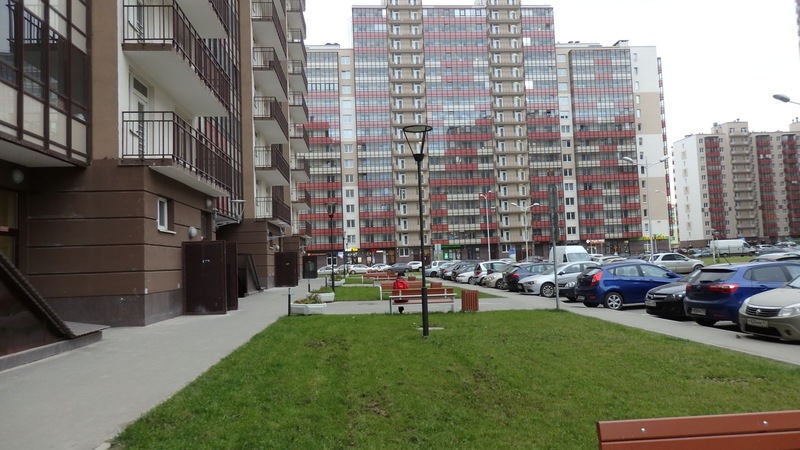 But it has ceded development of the rest of New Kudrovo to eight other developers, who are in the midst of building eleven other estates, with names as varied as New Okkervil, Austrian Quarter, Progress, Capital, Spring, and Kudrov House. All of these estates should be completed between 2016 and 2017. Prices for flats in the blocks (including resold units) range from 62,000 rubles to 125,00 rubles per square meter (i.e., between 880 and 1,770 euros, approximately). 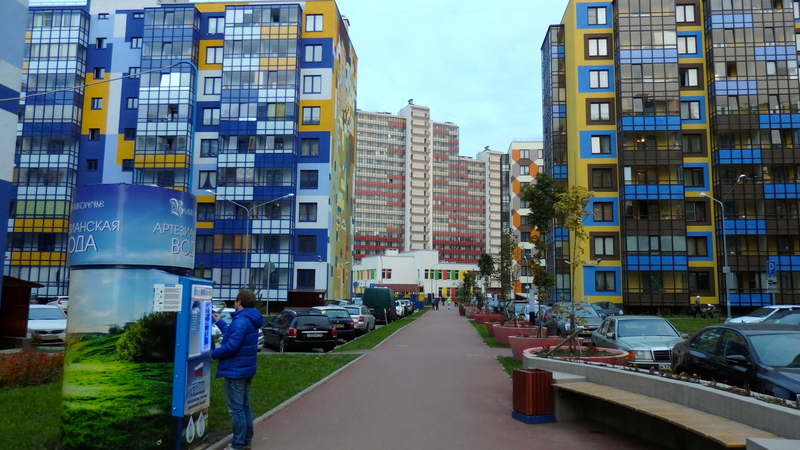 New Kudrovo is also a brisk fifteen minutes’ walk or a very short marshrutka ride from the Dybenko Street subway station, whence you can get to central Petrograd in something like fifteen or twenty minutes. And it literally abuts on the KAD, the Saint Petersburg Ring Road, which opened in 2011. But the place is still lacking in some essential infrastructure, given its ever-burgeoning population. According to the Real Estate Bulletin, the New Okkervil estate has a commercial kindergarten, with capacity for 230 children, and a municipal school and kindergarten with room for 1,600 pupils are set to open soon. 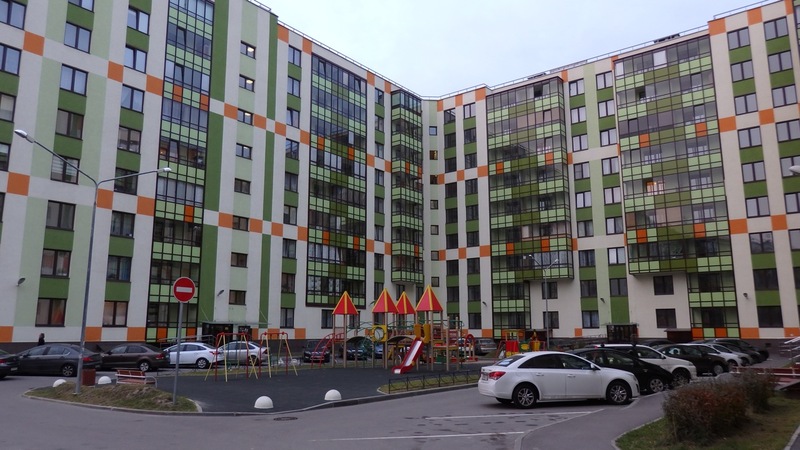 In New Kudrovo’s southern blocks, there is only one kindergarten, with capacity for 110 children, but by the end of the year there should be two more kindergartens and a school in the Vienna estate. More seriously, it appears that the New Kudrians will not be getting a subway station of their own until 2026, although our local companion claimed that the tunnel from Dybenko Street to the new station, tentatively dubbed Narodnaya, had more or less been dug already and the station platform itself had been built. All that was lacking was an aboveground pavilion or lobby and the shaft for the escalators down to the station. 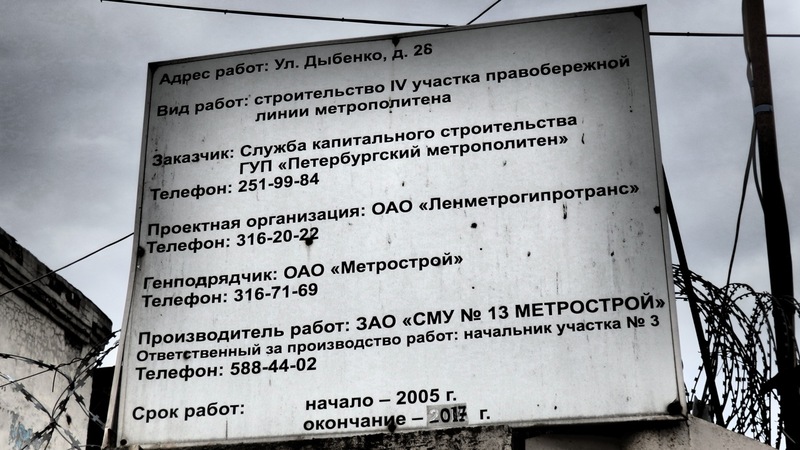 But since Kudrovo is outside the city limits, in Lenoblast, it is, apparently, not a priority for the city, which runs the subway system, to open a new station there. Although Deyvatkino station, the northern terminus of the First Line, which has been happily operating since 1978, is also located across the city lines in Lenoblast. In any case, as we made our way to the Okkervil River, Ingria, and Kudrovo, we passed this sign, indicating that some kind of subway construction was underway in the neighborhood. The sign promised a 2017 completion date. 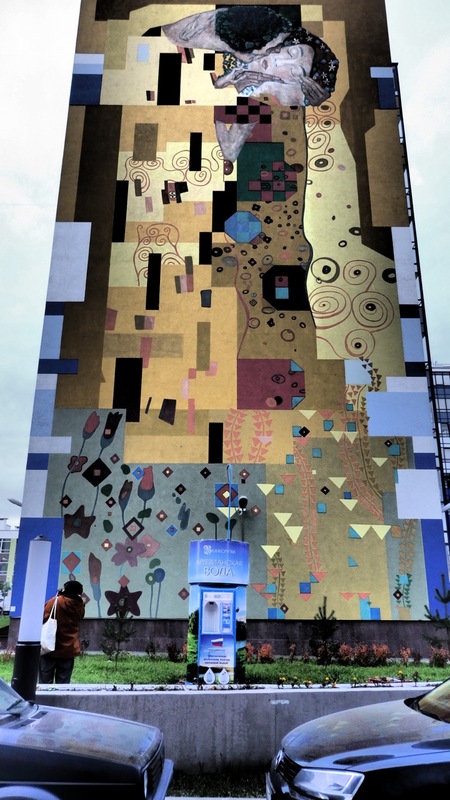 Whatever else it might lack, New Kudrovo has three things in spades. The first is splashy façades, something utterly untypical in the Northern Venice and environs. A resident purchases fresh artesian well water from an automatic, state-subsidized dispenser amidst splashy apartment blocks in New Kudrovo. 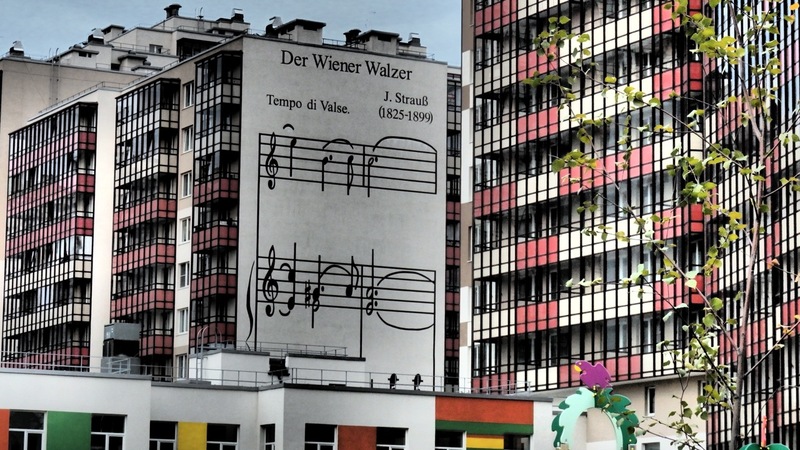 The second thing that meets the eye are the slightly over-the-top Viennese-themed murals in the Vienna estate. 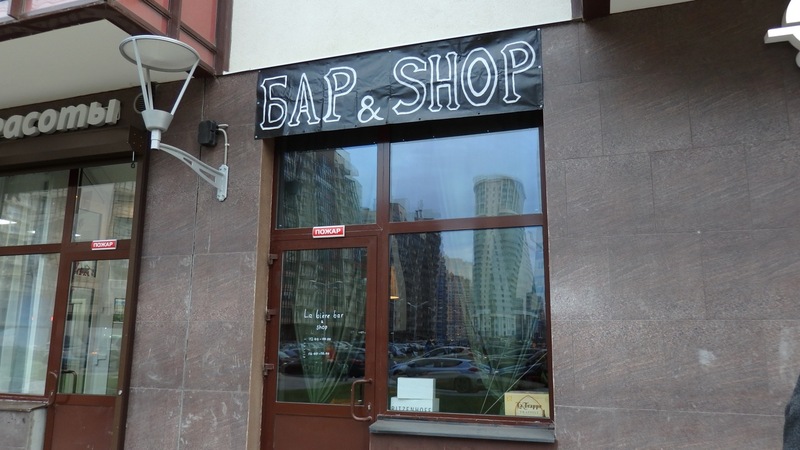 The third thing in no short supply in New Kudrovo, oddly enough, is pleasant hipsterish drinking establishments, all of them manned by extremely friendly bartenders, serving top-shelf Belgian beer. 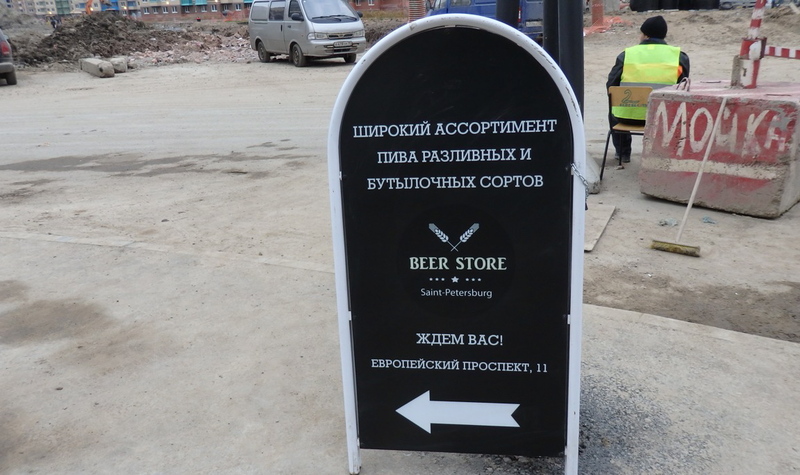 The Beer Store (European Boulevard, 11) has a large selection of draft and bottled beers. So if Will Sheff & Co. ever do decide to visit their spiritual homeland, here is what I would suggest. First, a big, open-air concert, amplifiers blaring, in Ingria Technopark, with the unfinished bridge serving as the bandstand. Then, the next day, an acoustic set in one of Kudrovo’s fine Belgian beer halls. It has to happen someday. All photos by the Russian Reader. Thanks to Comrades AS, MR, and DV for the company, and Comrade RF for suggesting that we trek to Kudrovo.